L.A.'s Windsor Square neighborhood seemingly comes out of nowhere. If you access it via Wilshire Boulevard — a busy thoroughfare lined with mostly unsightly high-rise office buildings — you'll suddenly find yourself driving down picturesque, tree-lined streets with grand homes (including the tudor revival residence of the city's mayor). It's a peaceful pocket with historical protections, which is why the houses there (a mix of eclectic yet historic styles) are so well maintained. So when Veneer Designs had a chance to renovate a 1,500-square-foot bungalow in the area, they looked to preserve the home's architecturally significant craftsman facade. The inside, however, is now thoroughly modern, with skylights that bring in the California sun, and patterned tiles that give the space a sense of chic playfulness. In the living room, an interwoven kilim rug is draped over a jute boucle rug from West Elm for a layered effect. Recovered vintage chairs were reupholstered in green velvet and adorned with pillows from vintage and handmade shop Loom + Kiln. A ventless fireplace insert from Ignis Products was coated with Benjamin Moore's Trout Gray. Throughout the home, green and gray hues create a calming theme. A branched ceiling light fixture from France & Son adds a bit of midcentury swing to the living room. A gray-hued sofa from Clad Home echoes the muted tones found in the mantle and the rug. The modern coffee table is from Blu Dot. During the renovation, Veneer Designs expanded the kitchen and gave it a modern upgrade — the mix of patterned tiles and custom wood cabinetry feels very of-the-moment-California without betraying the home's history. Open shelving displays the client's colorful collection of ceramics and glassware. While green and gray serve as a color theme in the rest of the home, the bedroom deviates with brighter hues and a mix of patterns. There's a mix of high and low in the bedroom — hairpin-leg side tables are from Modernica while the bedding is from Anthropologie. A black and gray Crate and Barrel rug balances the abundance of color in the bedroom. A bathtub by Americh is outfitted in California Faucets. 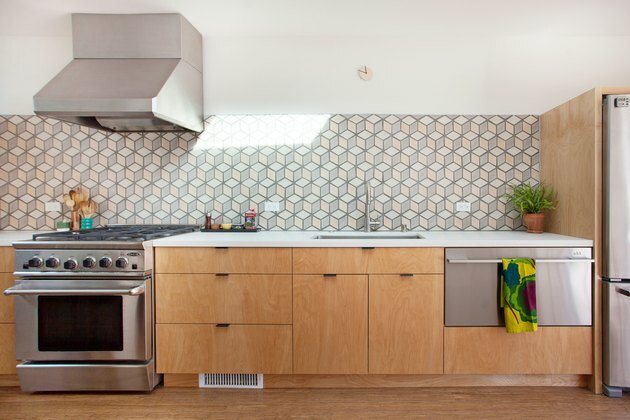 Custom cabinets with a midcentury vibe surround Cement Tile Shop Starburst tiles.